Diese Seite verwendet Cookies. Wenn du die Seite weiter nutzt, stimmst du der Verwendung von Cookies zu. weitere Informationen. Pre-order the VoiceNotes Ultimate Bundle and get downloads of “Attention,” and “How Long” instantly! The VoiceNotes Ultimate Bundle here comes with your choice of VoiceNotes on CD or as a digital album. 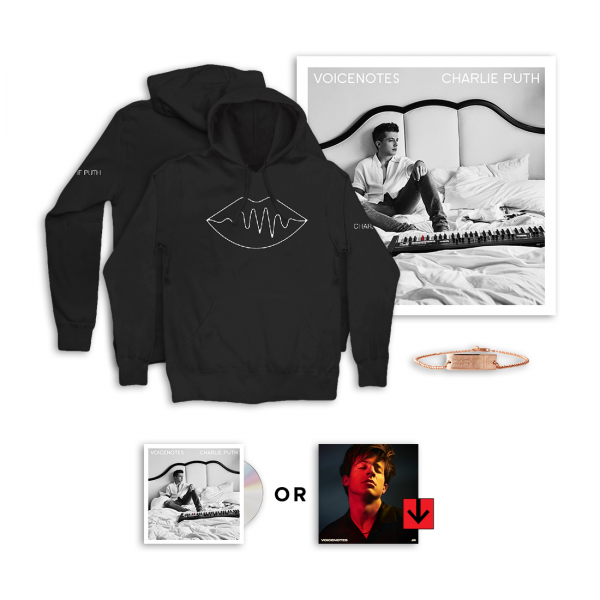 The bundle also includes an18”x18” print lithograph of the VoiceNotes album cover photo, and an exclusive black pullover hoodie that features Charlie’s logo printed on the sleeve and a “VoiceNotes Lips” design printed on the front featuring Charlie’s logo and name. Hoodie also features a drawstring hood and kangaroo front pocket. In your bundle you will also receive a rose gold “Soundwave” bracelet that features a design of an actual soundwave that is a 2 second snippet of Charlie’s single, “Attention”! Bracelet also featues has two chains attached to the engraved plate with a lobster clasp enclosure. Please note: the digital version of Voicenotes has a different cover from the physical CD, but the tracklisting is the same for both versions. Ja, bitte sende mir den Warner Music Newsletter, der auf meinen Informationen, Interessen und Onlineaktivitäten basiert gemäß der Datenschutzerklärung zu. Mir ist bekannt, dass ich mich jederzeit per Mail an [email protected] vom Newsletter abmelden kann.